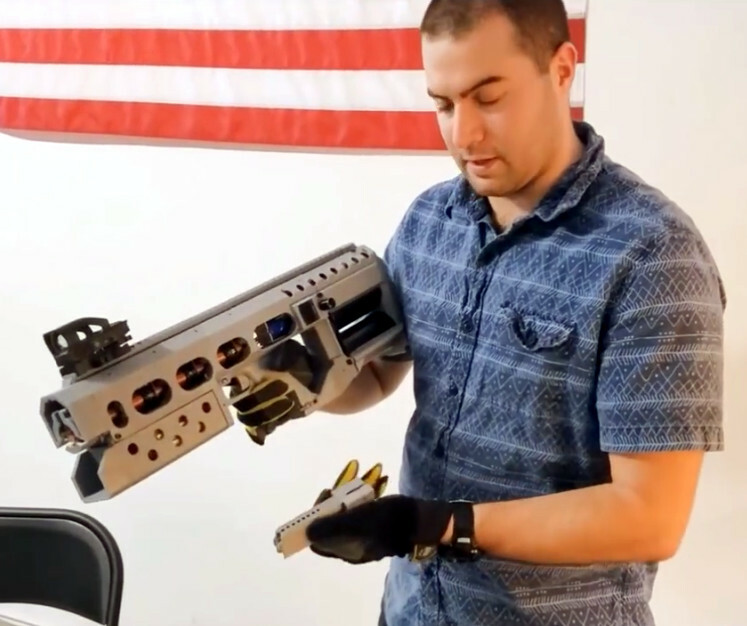 Arcflash Labs, a partnership between [David Wirth] and [Jason Murray], have put their EMG-01A Gauss gun up for sale for anyone who’s brave enough and willing to put down $1,000 USD on what’s essentially a high-tech BB gun. The creators claim it obtains an efficiency of 6.5% out of its RC-style 6S LiPo battery pack, which allows it to fire over 100 rounds before needing to be recharged. Firing 4.6g steel projectiles at a rather leisurely 45 m/s, this futuristic weapon would be more of a match for tin cans than invading alien forces, but at least you’ll be blasting those cans from a position of supreme technical superiority. The EMG-01A builds on the work of the team’s previous experiments, such as the semi-automatic railgun we covered last year. They’ve made the device much smaller and lighter than their previous guns, as well as worked on making them safer and more reliable. That said, the page for the EMG-01A has a number of warnings and caveats that you won’t see on the back of a Red Ryder BB gun box; it’s certainly not a toy, and anyone who takes ownership of one needs to be respectful of the responsibility they’re taking on. Speaking of which, who can actually buy one of these things? The Arcflash Labs site makes it clear they will only ship to the United States, and further gives a list of states and cities were they can’t send a completed gun. Essentially they are following the same laws and guidelines used for shipping air guns within the US, as they believe that’s a fair classification for their electromagnetic guns. Whether or not the ATF feels the same way is unclear, and it should be interesting to see what kind of legal response there may be if Arcflash Labs starts moving enough units. If you’d like to wage warfare on your recyclables without spending quite so much cash, you can always build your own for less. Or nearly nothing, if you want to go the full MacGyver route. While it may only be able to shoot a few cans right now, we certainly wouldn’t want to be in front of [Jason]’s fully automatic Gauss gun capable of firing 15 steel bolts from its magazine in less than two seconds. The bolts are fired from the gun with a linear motor. [Jason] is using eight coils along the length of his barrel, each one controlled by an IGBT. These are powered by two 22 Volt 3600mAh LiPo battery packs. As for the mechanical portion of the build, the bolts fired from this gun are actually 6.5mm nails, cut off and sharpened. These are chambered from a spring-loaded magazine, with each new bolt put into the breech with a small solenoid retracting for an instant. The frame is constructed from a square aluminum tube with additional pieces cut with a hacksaw and bent with an impromptu bench vise brake. If ever there was a person deserving of a bench top shear/brake, [Jason] is the man. The muzzle velocity of these bolts is about 40 m/s, with a muzzle energy that’s about 3% of a .22 LR round. Not deadly, but more than enough for picking off a few cans and bottles in a garage. You can see the video of this futuristic Gauss machine gun below. Remember this? We hit it last year. [William] has been working hard, and made plenty of improvements. Aside from building it in black, he’s built a new model. He’s even hoping to release it as a kit in 2007. 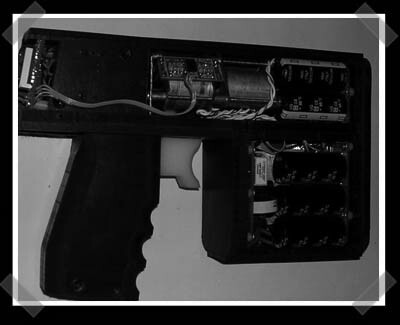 The latest version uses a PIC to fire the coils and manages the batteries, uses a pair of IR sensors to time the projectile, laser sighting and improved charging. It’s still only slightly more powerful than a CO2 BB gun, but one hell of an engineering challenge. Theoretically, these could be more powerful than traditional firearms, but power limitations keep them repressed like mid-evil peasants.